Customer Comments - Get Valuable Comments With Ease! Looking for more Customer Comments? Customer comments are valuable, but are difficult to collect. Customers never have the time! Comment Box makes it easy for your customers… and you. For your customers, it’s a chance to win a prize and to give their honest comments. For you, it’s actionable business intelligence that will help you maximize customer satisfaction and increase sales. Leaving customer comments with Comment Box is easy! Your customers use their mobile devices (iPhone, etc) and with a few simple taps their comments are on their way to you. With our straightforward customer comments summary reports, its easy for you too! Comment Box provides ready-to-use Printable Tag Displays that make it easy for customers to participate. 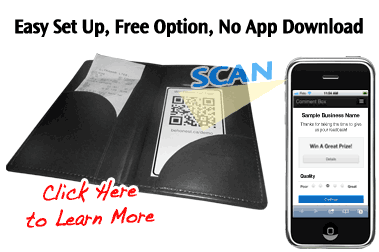 Your customers can scan the QR code or enter the easy URL. They are immediately presented with a simple comment card. The customer can choose to provide their email address to be entered in the prize draw. You can create your own Tag Displays and include Comment Box on your printed material, too! An automated prize draw process selects a winner and forwards the winning information to you for delivery (we’ll handle that for you! It’s that simple. And it works!